Ever since their first New York Fashion Week show in 2011, the Courtin-Clarins cousins have become a major hit in society circles and the fashion world. They’ve been featured in Vogue and on Vanity Fair’s “best dressed” list, and are constantly sent clothes, shoes, and accessories by big-name brands. Tall, gorgeous, thin, and French, the Courtin-Clarins cousins seem to have it all. They are staples at Paris Fashion Week, and have already been spotted at the front row of Chanel this season, not to mention a slew of NYFW shows earlier in February. New York Magazine, The New York Times, and Refinery 29 have all set out to answer that question, yet we still know surprisingly little about the four fabulous cousins. Here’s what we do know: Virginie, Claire, Prisca, and Jenna are the heiresses to the French cosmetics brand empire, Clarins. Their grandfather Jacques Courtin-Clarins founded the company in 1954, and it is now worth an estimated $3.6 billion, although that number is disputed and has most likely grown since the Courtin-Clarins family took the company private in 2008. Their fathers, Olivier and Christian Courtin-Clarins, now run the company, and were worth a combined $2 billion in 2012. Thanks to them, Clarins Group now owns the fragrance divisions of top jewellers David Yurman and Swarovski, has an 85 per cent stake in French fashion house Thierry Mugler, and a 10 per cent stake in French cosmetics company L’Occitane. 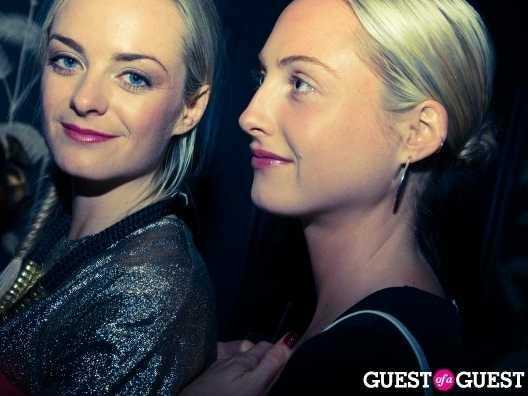 Virginie and Claire are the daughters of model Corrine Maine de Biran and Christian Courtin-Clarins. Virginie is 27 with long blonde hair that she wears in a signature fishtail braid, and graduated with a business degree from an unknown university in France. She owns her own swimsuit line, Luz, and lives in Paris. Her sister Claire is the tallest Courtin-Clarins at six feet, and has cropped blonde hair with large blue eyes. She studied architecture and graphic design, is 26 years old, and is an artist living in NYC. Their paternal cousins are the 26-year-old twins Prisca and Jenna. Prisca is the only brunette of the four women, and co-owns a trio of nail salons in Paris called The Nail Factory. She also lives in Paris, and is good friends with Nicola Fomechetti, the designer for Mugler. Jenna, on the other hand is blonde, with a self-described “rock n’ roll” style, and is a photography student living in Paris. Both twins are the daughters of sculptor and model Anneli Courtin-Clarins and Olivier Courtin-Clarins.All four women are brand ambassadors for Clarins and shareholders in the company. They’ve been testing beauty balms and makeup for their grandfather since they were children — from moisturizers to cellulite cream — and have launched their own “It Kit” of Clarins essentials as well as a Beauty Blog where they post videos of themselves explaining the correct way to use the products. Additionally, the cousins are on the supervisory board for Clarins, and help choose the brand’s charities. Their main project has been their involvement with the nonprofit organisation FEED, run by George Bush’s granddaughter Lauren Bush. As the Clarins brand continues to become a bigger name in the US — now selling at stores like Sephora, Macy’s, Bloomingdales, and Nordstrom — chances are we’re bound to see much more of the Courtin-Clarins clan.